Synthetic peptide corresponding to Human CROT/COT aa 57-86 (N terminal) conjugated to keyhole limpet haemocyanin. WB: K562 cell lysate and mouse liver tissue lysate. 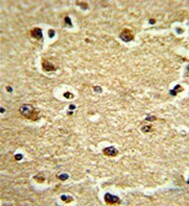 IHC-P: Human brain tissue. Flow Cyt: K562 cells. ICC/IF: T24/83 cells. ab103448 is prepared by Saturated Ammonium Sulfate (SAS) precipitation followed by dialysis against PBS. Our Abpromise guarantee covers the use of ab103448 in the following tested applications. WB 1/50 - 1/100. Predicted molecular weight: 70 kDa. ICC/IF image of ab103448 stained T24/83 cells. The cells were 4% formaldehyde fixed (10 min) and then incubated in 1%BSA / 10% normal goat serum/ 0.3M glycine in 0.1% PBS-Tween for 1h to permeabilise the cells and block non-specific protein-protein interactions. The cells were then incubated with the antibody ab103448 at 5 µg/mL overnight at +4°C. 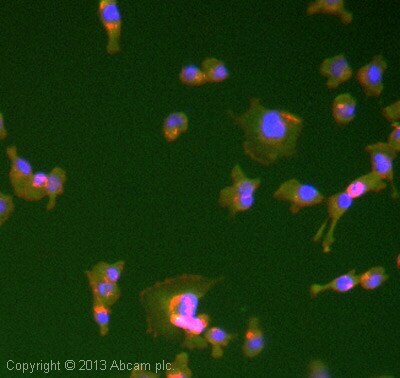 The secondary antibody (green) was DyLight® 488 Goat anti-Rabbit IgG (H+L) (ab96899) used at a 1/250 dilution for 1h. Alexa Fluor® 594 WGA was used to label plasma membranes (red) at a 1/200 dilution for 1h. DAPI was used to stain the cell nuclei (blue) at a concentration of 1.43µM. ab103448, at a 1/50 dilution, staining CROT/COT in formalin fixed and paraffin embedded Human brain tissue which was peroxidase conjugated to the secondary antibody, followed by DAB staining. 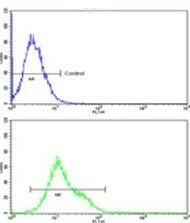 Flow cytometric analysis of K562 cells with ab103448 at a 1/10 dilution (bottom histogram) compared to a negative control cell (top histogram). FITC-conjugated goat-anti-rabbit secondary antibodies were used for the analysis. Publishing research using ab103448? Please let us know so that we can cite the reference in this datasheet. There are currently no Customer reviews or Questions for ab103448.